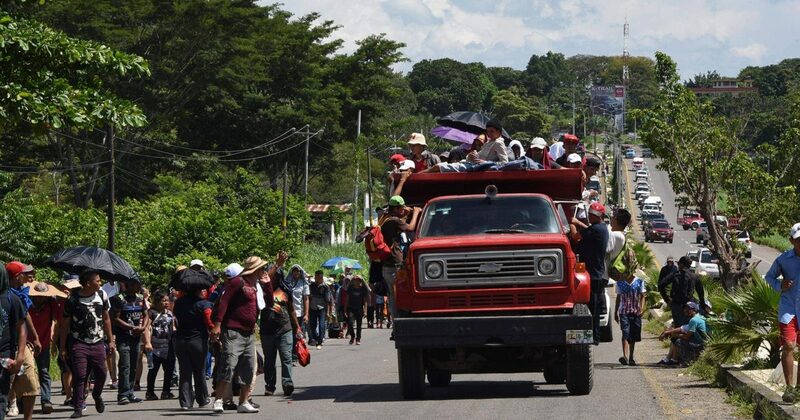 The caravan moving through Mexico is the work of an open-borders group called Pueblo Sin Fronteras. Its goal is to either to nullify the U.S. asylum system by inundating it or overrun the border by sheer numbers alone by employing thousands of migrants to the U.S. border. According to a Gallup survey published right after the midterm elections, five million Central American residents, one out of three adults wants to migrate to the United States. Open-border groups plan to take advantage of the fact that the U.S. troops won’t shoot invaders. As usual, President Trump thwarts their stupid plan. The military and border patrol may deploy a non-lethal defense system developed by the Department of Defense ten years ago. This system strengthens American sovereignty and helps secure our border. The Solid State Active Denial system forces the target to flee the area using sound. It causes an intolerable pain response, but leaves no injury or long term-effects. SSADS deploys a radio frequency milliliter waves that create a sensation of intense heat. The sound forces those targeted to retreat. The Marines showcased the effectiveness of the system SSADS against a large crowd in footage released in 2012. The demonstration also shows how the system may used against individuals who are specifically targeted. The non-lethal defense system was designed for crowd control, protection of convoys and personnel and security checkpoints. The system deters targets up to 700 yards away. Migrant invaders have been warned and they chose to keep coming. Hopefully SSADS is employed to detour the next batch from attempting to cross our border. Also, let’s hope the new wall integrates this technology, and automatically deploys when someone attempts to scale the wall.